The new iPad mini has the same A12 Bionic chip as the iPhone XS and iPhone XR, with Apple saying that it delivers "three times the performance and nine times faster graphics." The Retina display on the model is laminated like the iPad Air 3 and iPad mini 4, now has True Tone technology, and the highest pixel-density of any iPad at 326 DPI. First generation Apple Pencil support has arrived on the iPad mini as well. The second generation Apple Pencil as seen with the iPad Pro lineup is not compatible with the new model. The new iPads are available to order starting on Monday, and in stores at some point the week of March 25. The new iPad mini starts at $399 for the Wi-Fi model and $529 for the Wi-Fi and Cellular model. 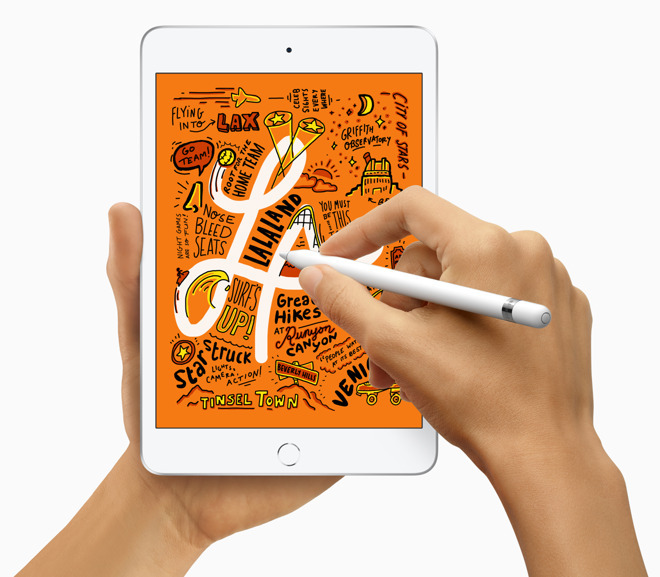 The Apple Pencil is a $99 addition. Several Apple authorized resellers, however, will not collect sales tax in many states, making the purchase slightly more affordable (details can be found in our iPad mini 5 Price Guide). The last time the iPad mini was updated, it was at 2015's event where Apple unveiled the ability to say "Hey, Siri" to summon the assistant. That fourth generation iPad mini cost the same $399 but featured 16GB of flash storage and could go up to 128GB. The new 2019 model starts at 64GB of storage and can be configured for 256GB. The older model also had the then-new A8 chip, sporting the 1.5 GHz dual-core Apple Typhoon, coupled with a Quad-core PowerVRGX6450 GPU.